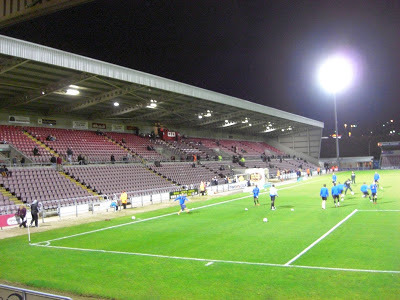 My eighteenth stadium of 2012 was on Tuesday 9th October 2012 at the Sixfields Stadium in Northampton, Northamptonshire. The match was Northampton Town vs. Colchester United in the Johnstone's Paint Trophy 2nd Round. Sixfields Stadium is located to the west of Northampton town centre next to a retail development. The venue is around 1.5 miles from the town's railway station and has been home to the club since 1994 when they moved from their former home at the County Ground where they had played for the previous 97 years. The West Stand is the largest structure in the ground and runs the length of the pitch on the western side of the venue. 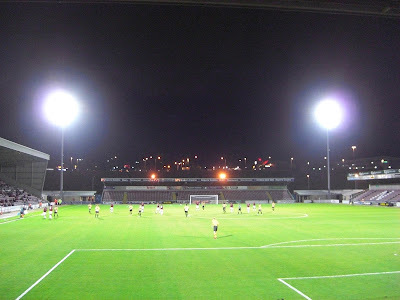 It has a capacity of just under 4,000 and while single-tiered it is split into two sections with a walk-way in between the top and bottom sections of the stand. This stand also contains all the hospitality areas and the dressing rooms. 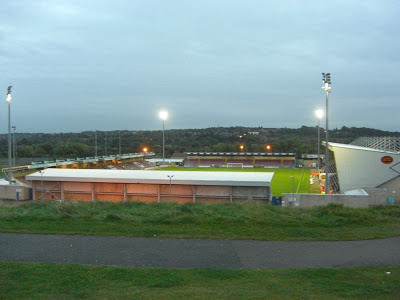 Opposite this is the East Stand which is currently being rebuilt to expand from its former capacity of 1,700. The North Stand and South Stand sit behind the two goals and hold around 900 fans each. These stands only take up about three-quarters of the space behind the goals with the rest of the space taken up by toilets and a food outlet. This means there are sizable gaps between all the stands which provides the club with ample room for expanding the stadium beyond the modest 7,600 capacity it has at present. The game was a Football League Trophy 2nd Round tie between Football League Two side Northampton Town and Football League One side Colchester United. The visitors started well and should have taken an early lead when a Freddie Sears cross found an unmarked Karl Duguid a couple of yards out. Duguid however put it over the bar and missed chances was the story of the opening period with Colchester comfortably the better team but with nothing to show for it. Colchester finally got their noses in front just after the half-hour mark when the ball fell to Sears in the box and he tucked the ball home. The League One side continued to press until half-time but there were no more goals. 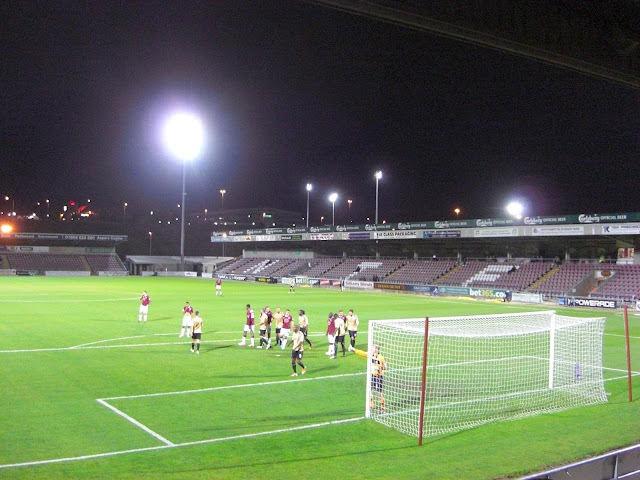 The second half was a different story with Northampton the stronger of the two teams. They equalised just after the interval from the penalty spot after Alex Gilbey tripped Kemar Roofe in the area. Adebayo Akinfenwa dispatched the spot kick and 90 seconds later the turnaround was complete as the ball was whipped into the box and Henoc Mukendi headed in off the post. The hosts continued their good play and almost had a third soon after as Colchester found themselves on the back foot. It wasn't until the last 15 minutes when the visitors began to produce a few chances but with the Northampton goalkeeper rarely being tested Colchester didn't look like adding to their first half goal. In the 95th minute a bad night for the visitors was completed when Clinton Morrison was sent off for violent conduct. The referee blew the final whistle shortly after and it was Northampton who advanced to the next round with their 2-1 victory.